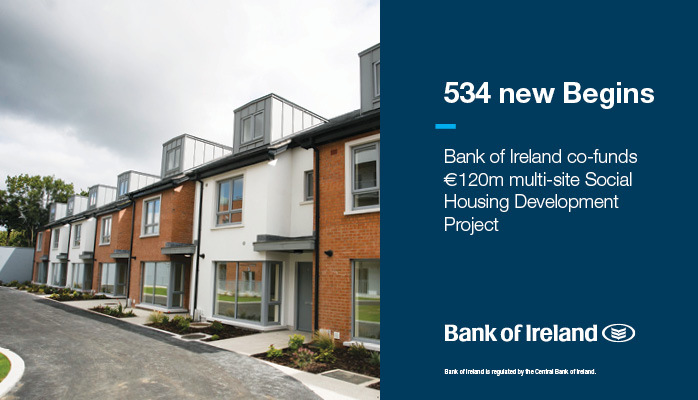 Bank of Ireland Corporate Banking is supporting the development of 534 social housing units under a Public Private Partnership (PPP) initiative sponsored by the Department of Housing, Planning & Local Government and Dublin City Council, and procured by the National Development Finance Agency. A consortium (Comhar Housing Limited) comprised of Macquarie Capital as equity Sponsor, John Sisk and Sons (Holdings) Ltd as Construction Contractor and Choice Housing Ireland Limited as Facility Manager was awarded the PPP contract. Bank of Ireland will co-finance the design, build and maintenance of 6 social housing sites, with all units being built to an A2 energy rating standard and will be credited with a Nearly Zero Energy Building (NZEB) consumption certification. Construction in the Dublin and Greater Dublin region will start immediately with completion expected in 2021. Tom Hayes, Chief Executive of Bank of Ireland Corporate Banking said; “we are delighted to support the winning consortium Comhar Housing Limited, and specifically Macquarie Capital, with this PPP initiative which promises to change the lives of hundreds of families in the Greater Dublin area. Bank of Ireland’s leading role demonstrates our commitment to play a central part in funding the development of new homes in Ireland. We look forward to working with all the parties involved to make it a success”. Mark Bradshaw, Head of Infrastructure Projects for Macquarie Capital in Europe and the Americas said: “As the need for greater social and affordable housing provision continues to grow globally, awarding agencies are increasingly looking to PPP frameworks. We invest in the early development stages of projects globally, applying both balance sheet capital, development capital and infrastructure expertise to make critical projects such as this happen”.